Nameplate and plaque on Robert Sergi Bridge are dedicated to the memory of Robert Sergi who was killed in a workplace accident. In 2000, Mr Sergi was a 40-year-old crane company owner helping to build the overpass across the Melbourne to Geelong railway line. Shortly after 7am, the 700-tonne concrete girder on which he and three others were standing collapsed. His workmates were hurt but Mr Sergi suffered a severe head injury and died at the scene. In 2004, construction company Leighton Contractors Pty Ltd was ordered to pay a total of $525,000 in the Geelong County Court after pleading guilty to four counts of failing to maintain a safe working environment under the Occupational Health and Safety Act 1985. It was the biggest penalty imposed on a company over workplace death since the 1998 Esso Longford explosion. 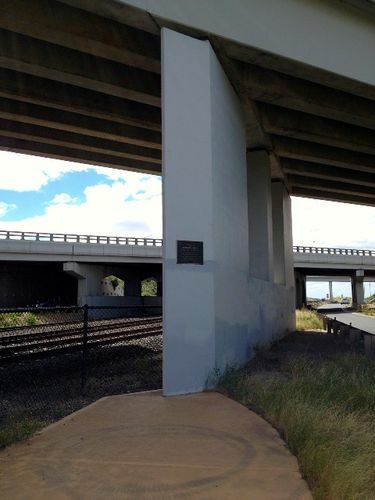 Died tragically during the construction of the Corio overpass. This plaque is a monument to Rob and those who worked with him on fateful night .